Syringomas are benign sweet duct tumors or bumps arise just below your eyes. The bumps are around 1 to 3 mm in diameter. 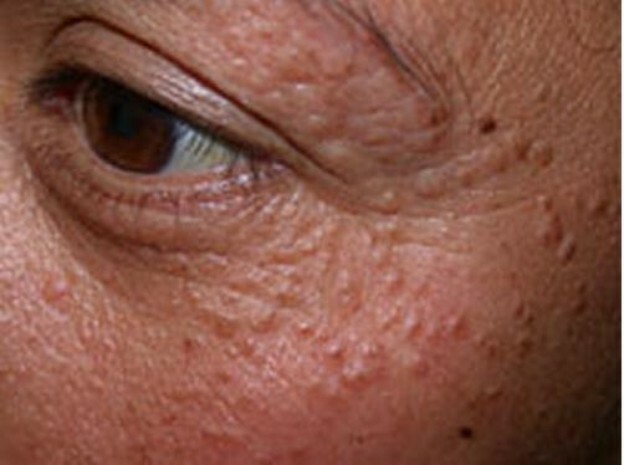 Syringomas appear more common in women. Furthermore, they can develop at any time in your life, more commonly in adolescence. Fortunately, you would not have itchiness and pain while you present syringomas, but importantly, it affects to the general appearance of those who are suffering from syringomas. Many people think that genetics attribute are one of the reasons of syringomas. However, the exact etiologies of it have been unknown up to now. In contrast, there are some acceptable theories nowadays. The most common one is that syringoma grows because of the overactivation of intradermic part of eccrine ducts. The second reason could be because of the hormone imbalance in women. Besides, those who are suffering from diabetic mellitus and Down syndrome have higher risk of syringomas. There are some medical and surgical treatments which have been studied such as carbon dioxide laser, dermabrasion, surgical excision, electrocoagulation and chemical peels. However, these methods are time consuming and still have some adverse effects such as redness, scarring, pain and skin discoloration. Don’t be worried, there are some home remedies could help you get rid of syringomas without harm so easily and extremely effective. Aloe Vera is a well-known natural remedy for skin conditions and syringomas is one of those. The inner jelly-like substance of the aloe plant leaf has benefit in healing wound, moisturizing the skin and gets rid of scar. Apply 0.5 percent cream derived from Aloe Vera three times daily or rub the gel of Aloe Vera leaf over the affected area several times a day will help have a delicate skin. Potatoes are considered as a vitamin C- rich food. It is also beneficial in maintaining skin health. Apply peeled potato on affected area for 10 minutes. You can also make a face mask with grated potatoes mixed with yoghurt then apply in your face for 20 minutes in order to have a healthy skin. Lemon is known as a natural option to get rid of syringomas on your skin. This is because the acidity of lemon can remove the oil from your skin. · You can make your own facial mask with equal volume of lemon, water, honey and aloe. Then smear this mixture on your skin for 15- 20 minutes. Let’s lie down and enjoy yourself with music. · Squeeze the juice of lemon slices into a cotton ball, and then wash over the affected areas. Apple Cider Vinegar has been studying by Carol Johnslon, PhD, director of nutrition program at Arizona State University for 10 years. She believes that it is effect on blood sugar control. That is the reason why Apple Cider Vinegar is used for various purposes for centuries. Especially, it is an effective home remedy for syringomas. The usage of Apple Cider Vinegar is similar to lemon juice. Dip the cotton ball into the dilution Apple Cider Vinegar and water, apply it over the affected areas, cover with a bandage and remove it after one night. You will see the best result after 10 days. Garlic contains a large amount of allicin, which has benefits in anti-aging, antifungal and smooth skin as well. Garlic can also have effect on skin discoloration and help you remove syringomas. Apply slices of garlic on the areas presenting syringomas. Use the bandage to cover it at night and then remove it in the next morning. Mix sandalwood powder, milk cream and rose water, then apply it on your face or one the affected areas. By following this process, your skin will lighten and scars can remove. Syringomas also treat effectively at home with almond oil. Massage your skin with some drops of almond oil, it helps your skin smoother and scars will disappear. You can also get rid of syringomas with some drops of castor oil applying on the affected areas like almond oil. However, castor oil has more effectiveness when you use with baking soda. You will see the best result if you try twice a day. In cases that have puberty and hormonal imbalance, oily skin will appear. Make sure that you clean you skin everyday in order to get rid of oily skin and syringomas. Excessive drinking alcohol leads to skin discoloration and your skin also presents syringomas. If you want to have a beautiful skin and attract others, please say no with alcohol. REMEMBER: It would take time. Be patient! Then you can see the bumps disappearing and the scars healing. Jelly Jeff is a senior editor of Authority Remedies; that a website which is specialized in providing natural home remedies, tips and also nutrition facts to improve the well-beings. She is a nurse but she keens to explore nutrition and fitness. In addition, she loves writing and doing research. She appreciates to be a good writer in nutrition. I think i need to share this information with a cousin of mine, she have been suffering from this ailment for some time now. Someone I know is going through this for the last 3 months and has tried different medications with no luck. I might have to refer these things! Yea, maybe you should give them a try. I feel like my friend may be suffering from this as she has broken out in tiny spots around her face and it has stayed like that for almost a year now! I will definitely share this with her! I am so glad coming across this tips. Will share it with my friend too. iv'e been suffering this since I was a highschool student then after I graduated from college. I DO CO2 laceration and it's painful after the treatment for almost 2 months. It was disappeared but when I slighlty expose to sunlight and get sweat more often. My syringoma appear again and I didn't take a CO2 lacer . :( Whats the safest way to treat it without scar?